Central banks are in the spotlight this week. Further on, we write about the Bank of Japan (BoJ) tweaking their Quantitative Easing (QE) Programme but keeping monetary policy supportive. In the US, the Federal Open Market Committee (FOMC) is keeping the federal funds rate unchanged at 1.75-2.00%, with most economists believing a September hike is very likely (90% probability saying rates will rise again). At home here in the UK there is a change of direction. Interest rates are going up but at a slow pace. Below we go into more detail to help you understand the causes and possible effects. We start with the UK first because what is happening domestically matters to all of us. 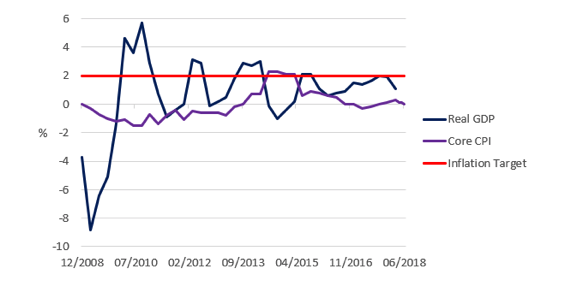 In previous editions of our weekly economic update we have pointed out that after many false starts a rise in UK rates was likely to happen soon. Ever since the financial crisis unfolded the decision to commit to raising interest rates, having slashed them to avoid deflation, was always going to be difficult. On Thursday, the announcement of a 0.25% rate rise, agreed by all 9 members of the Monetary Policy Committee, did not come as a major surprise having been well flagged in advance. According to a Bloomberg poll the probability of a rise was set at 92.5% before the meeting. The rationale for the Bank of England (BoE) raising rates is simple; the UK economy is showing tentative signs of strength, with the labour market outperforming. Unemployment is sitting at 4.2%, the lowest figure seen since June 1975. 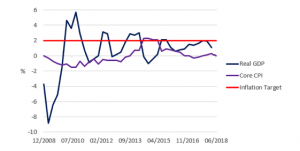 Although the relationship between falling unemployment and rising wages and prices has broken down, the expectation is that this link will establish itself again at some point. When this happens it will be positive for wealth, spending and growth. Another aspect worth bearing in mind is that real interest rates, after taking inflation into account, are negative. This means policy is very loose and it allows the BoE to raise rates now without unduly restricting growth in the future. Note: The Bank measures inflation using the Consumer Price Index (CPI). It is currently 2.4% and above the Bank’s 2.0% target. The rate rise will help mitigate the possibility of inflation moving further away from target. If you recall from our previous weekly economic updates, the bank had been expected to raise rates in Q1 of this year. However, weak economic data forced the bank to review its plan. They suspected the soft patch in spending would be temporary (caused by adverse weather), and this has proved to be the case. Since Q1 there has been a rebound in retail sales, boosted by both the Royal Wedding and the World Cup. Stronger consumption helps underpin growth in the broader economy, measured by Gross Domestic Product (GDP). The decision by the BoE to put up interest rates for the first time in 9 years represents a step towards policy ‘normality’. It is indicative of the bank taking tentative steps in order to avoid upsets along the rate raising journey. Yes, higher interest rates will mean higher borrowing costs for some but the context for this happening is favourable. It is indicative of more confidence in the growth outlook. The BoE also gave some clues about what is in their thinking as regards the ‘equilibrium’ rate of interest. An equilibrium rate of 5% was thought to be needed to mark the point beyond which policy would become restrictive. New thinking is that the equilibrium level lies between 2-3%. The implication of this for cash-based savers is that cash returns will remain unremarkable for longer than they ever imagined. Developed economies around the world have been on a lengthy recovery since the financial crisis 10 years ago. The US Federal Reserve bank, the Bank of England and the European Central Bank have now all started to reverse their loose monetary policies. Japan is the exception. With a rapidly ageing society, poor demographic trends have kept the Bank of Japan (BoJ) in check. Like other leading central banks, the BoJ introduced ultra-easy policies to shore up domestic economic growth after the crisis. Japan’s central bank also initiated its own programme of quantitative easing on a huge scale more than five years ago. Two years later it added an explicit price target for Japanese government bonds and introduced negative short-term rates (effectively applying a cost to savers) and pledged to keep the 10-year yield at “around 0%” to encourage spending. This policy is referred to as zero interest rate policy or ZIRP. The chart below puts into context the extent to which Japan, relative to its GDP, has used quantitative easing compared to the US, UK and Europe. 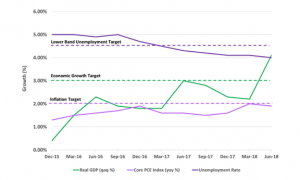 Despite this ultra-accommodative policy, and improvements in economic growth, hitting the BoJ’s policy target of 2% inflation has been elusive. The chart below highlights a decade of deflation suffered in Japan, with prices barely rising despite all efforts to get them higher. At Tuesday’s policy announcement, BoJ governor Haruhiko Kurdo confirmed no major adjustments to its current ¥80trn a year quantitative easing programme. For the first time, they provided forward guidance, stating that current interest rates would continue for “an extended period of time”, crushing thoughts of a move towards higher rates. Mr Kurdo stated that the BoJ wanted to achieve 2% inflation as soon as possible but cautioned that this target might not be reached before 2021. With the BoJ continuing to ease, this should in theory, extend the “carry trade” whereby investors borrow in yen to reinvest in higher yielding currencies or markets abroad. This remains a high-risk strategy for even the most sophisticated investor. However, an extension of cheap liquidity should help maintain liquidity levels not just in Japan but around the world. The Federal Open Market Committee (FOMC) gave an incredibly bullish assessment on the US economy during their meeting on Wednesday with its minutes reporting “the labour market has continued to strengthen” and “economic activity has been rising at a strong rate”. As mentioned earlier, in the lead up to the meeting analysts had correctly predicted that interest rates would be maintained in the current range of 1.75% – 2.00%. This is in line with the committee’s commitment to increasing rates gradually to prevent policy shocks. i.e. a reassuring signal from the Fed that they will not raise rates too high or too quickly. 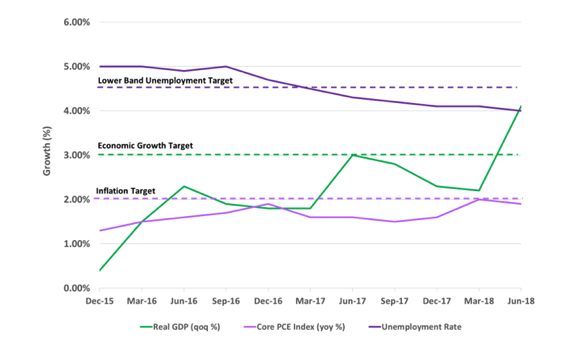 The bullish assessment is driven by strong data in relation to economic growth, employment and inflation illustrated in the chart below. Economic growth, as measured by GDP%, has jumped from 2.2% in Q2 to 4.1%, breaking through the 3.0% target. This has been stimulated by increased levels of business fixed investment i.e. infrastructure. It also reflects growing business confidence for the future and gratitude for Trump’s $1.5trn tax cut amid the on-going risk of trade wars. Consumers have also played an important role by increasing spending on non-durables such as food and clothing. Again, reflecting enhanced confidence and purchasing power. Consumer confidence in the US economy is currently at a 17-year high, a commendable achievement for the Fed. Increasing confidence helps their efforts to enhance financial stability. This confidence is coupled with higher wage packages offered by firms looking to attract workers in a tight labour market. Unemployment is currently 4.0%, well below the government’s lower band target of 4.5%. Consumers who are willing and able to spend more boost the economy. Inflation remains key to interest rate decisions at the FOMC. The central bank is aiming for price stability to avoid any potentially adverse impact on consumer purchasing power, savings and business international competitiveness. The latest figures show inflation, as measured by the Fed’s preferred measure ‘Personal Consumption Expenditure Index’ (PCE), below the 2% target. So far at least this vindicates their gradual approach to rolling back ultra-loose policy. With the outcome expected markets were unchanged following the news. Fed Chairman Jerome Powell has generally been praised for his transparency and communication with markets since his appointment. The committee will reconvene for two days on the 25th September to vote on interest rates and analysts are suggesting there is a 90% chance a hike will occur taking rates to a range of 2.00 – 2.25%.